What will be the impact of artificial intelligence on video surveillance & analytics? What is the market worth now? We have defined AI Video Analytics as a solution that is running deep learning algorithms on a platform that is most likely to be built on a GPU chip architecture. These solutions are very much in their embryonic stage and our best estimate is that global sales of AI Video Analytic solutions in 2017 was only around $115 million, much of this being installed in China on Safe City projects. Video Surveillance systems generate vast amounts of data that is sadly not being utilized properly. There is huge potential to maximize the value of this data by converting it from “dumb to actionable”. The material is already out there just waiting to be mined. New chip architectures combined with AI video analytics software when put to work on these gargantuan volumes of data should improve the security, safety and performance of people, buildings and the business enterprise and at the same time provide a major boost to the Video Surveillance Ecosystem. Current law enforcement systems are increasingly unable to cope with the sheer volume of surveillance material captured and stored every day. This is only set to rise, with the population of video cameras increasing by at least 12% per year. These video streams will only ever be useful if processes to search and analyze the mountain of data keep pace. As it stands today vital information is missed because the vast majority of video is simply never viewed. 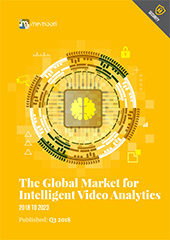 In order to both size the potential market and future for intelligent video analytics software, in this report we also establish the size of the Video Surveillance equipment business, how it is organized and then focus deeper into the Video Management Solutions (VMS) business as this is where current analytic software for the video surveillance business is most often applied. Today most of the software used falls outside our definition of being “AI Video Analytics” but in the future it will be an inextricable part of it. We therefore review the video surveillance and the VMS business in order to make a serious attempt to forecast the demand for the AI Video Analytics market. We have identified some 128 companies that are currently active in supply chain for AI Video Analytics. New companies are being added to this list almost daily and we cannot claim that our list is fully comprehensive. Nvidia has emerged as the early leader in AI chips and is particularly strong in video analytics. Nvidia’s edge is that its PC gaming processors (GPUs) can be scaled up to handle AI software, thanks to their “parallel processing” circuitry which can handle complex multiple tasks. China has publically announced its government strategy to dominate AI technology. Its Internet giants like Baidu, Alibaba Group Holdings and Tencent Holdings are pouring money into AI research. China produces around 40% of the world’s video cameras and consequently will generate massive amounts of raw data to train AI systems in how to make predictions. There is good reason to think China will make breakthroughs in developing computer algorithms for video applications. We believe there are 2 main factors that will determine the future role that the suppliers of the video surveillance market will play. The first is the broad split between the Enterprise market and the SMB market and the 2 methods of applying AI through either the edge or the cloud. In this report, we have detailed some 6 methods of applying AI and deep learning. They all have benefits in particular applications but all to often in the past there has been a failure to take into account the need to simplify the installation and configuration and more importantly satisfy the buyer that the system is reliable and robust. Starting at only USD $1,750 for a Single User License, this report provides valuable information into how Video Surveillance and IT companies are developing their businesses through Investment, M&A and Strategic Alliance. The Information & Data contained in this Report will be of Value to all those Engaged in Managing, Operating and Investing in Video Surveillance companies (and their advisors) around the world. In particular those wishing to understand exactly how Artificial Intelligence is impacting the business, will find its contents particularly useful. Can AI Video Analytics Software Deliver?